I'm the kind of person who stays in bed as late as possible, then rush to get ready, so every second counts on a school morning. When the kids were smaller, they knew that even asking me for oatmeal on a school morning was enough to send me into a bad mood. We all adore oatmeal, but the stress and rush wasn't worth the extra 10 minutes (2 minutes per bowl, 5 bowls)! Now that they're older, the kids can microwave their own oatmeal, but more often than not I have to deal with cleaning up the boiled-over oatmeal and milk from the inside of the microwave. Ugh. 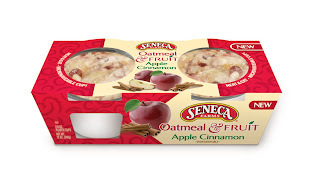 Given my rushed lazy busy morning style, I was delighted to be invited to sample Seneca Farms Oatmeal & Fruit, ready-to-eat oatmeal cups with real oatmeal and fruit. I tried their Apple Cinnamon and Vanilla Peach varieties, and I'm raring for more! Seneca Farms Oatmeal & Fruit ready-to-eat oatmeal comes in packs of 4 6-oz. microwaveable cups. No water, milk, or other liquids are needed -- simply heat in the microwave for 45 minutes. Oatmeal & Fruit comes in 2 flavors, Apple Cinnamon and Vanilla Peach, with 2 more (Cranberry Apple and Maple & Brown Sugar) to be introduced in the future (click here for places you can purchase this product). and is a great source of Vitamin C. Two initial flavors are being introduced - Apple Cinnamon and Vanilla Peach. More flavors and retailers will be added in the coming months. * They are soooo quick and easy to prepare; 45 seconds is just enough time to warm everything through (by the way, they taste wonderful cold as well, the only kind of oatmeal I've ever said that about!). My kids could easily prepare this by themselves in the morning (assuming I haven't eaten it all myself) in the same amount of time it takes for them to get their cereal and milk! 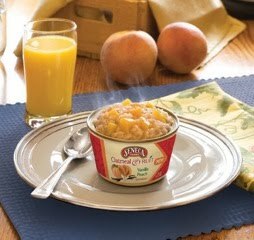 * Unlike other instant or ready-to-eat oatmeal products out there, this product has real fruit: gooey stewed apples and sweet golden peach bits. You can see and taste the chunks of fruit, and it really makes the whole thing a treat. * It tastes amazing. Great (with a Capital G, remember?). So Great, in fact, that after trying the first one I decided not to share any with the kids. Yup, I hid all 4 cups from them and ate them all by myself. Some people might find this a bit too sweet, but not for me! My only real problem with this product was the packaging: I was nervous about putting the little cups of oatmeal into my microwave because it looked like each plastic bowl was rimmed by a strip of metal. Alfie convinced me that it was fine, and indeed it was; the microwave didn't arc or spark so I guess it wasn't metal after all. But I'm willing to bet that other people might think the same thing -- and more importantly, kids might look at it and think that it's okay to put any shiny silvery object into the microwave since this one was fine. 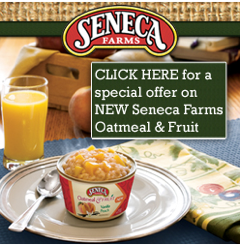 Seneca Farms Oatmeal & Fruit is a delicious, easy way to get a hearty, healthy breakfast or snack.